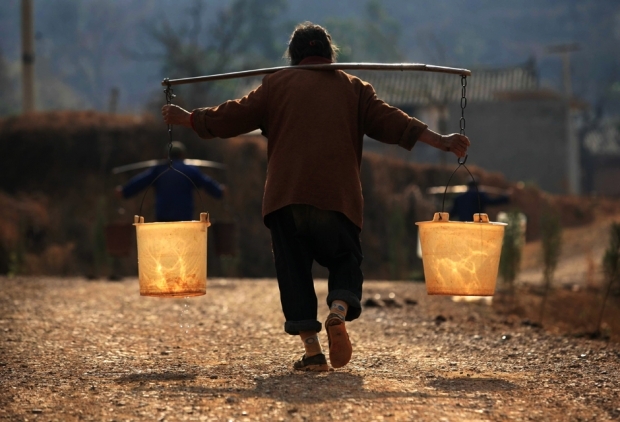 Villagers in Yiliang, Yunnan province, carry pails of water they collected from a well back to their homes. By Yang Fangyi, climate change project officer at the Shan Shui Conservation Center, and Zhou Jiading, Ph.D. student at Peking University’s Centre for Nature and Society. This article was first published by chinadialogue. Yunnan’s drought continues. During China’s annual parliamentary session in March, the deputy party secretary of the southwest Chinese province, Qiu He, blamed spring floodwaters that flow through Yunnan and on into other countries for the water shortages. He proposed a system of reservoirs, dams, and tanks to store that water, which could then be distributed more evenly over time and between locations. But many complained that Chinese officials were trying to pass their own troubles on to others. Historically, Yunnan hasn’t been known for suffering droughts. Today, however, it is famous for it. The winter and spring droughts that started in 2009 continue to plague China’s southwest, harming the region’s vulnerable economy—particularly agriculture and forestry. Cash crops such as sugar cane and coffee have been lost, and the crisis is restricting Yunnan’s economic growth. If you look at the amount of precipitation in Yunnan, you might struggle to understand how the province could be hit by drought. The monsoons bring plenty of rain during a distinct wet season. However, thanks to the province’s geography, that rain falls unevenly. Some southwestern areas can see as much as 3,000 millimeters of rain a year, while arid valleys might have less than 500 millimeters. So climate and geography result in an uneven distribution of water, and therefore shortages during the dry season. Normally, Yunnan’s forests and wetlands regulate this imbalance, acting as sponges that soak up water during the monsoons and gradually release it. Millions of people in Yunnan benefit, including those living downstream of Yunnan’s six major rivers—in the Yangtze and Pearl River basins, for example. But the continued drought is a warning of the damage being done to those ecosystems. Yunnan is heavily forested. But the original forests, able to store and regulate water, have virtually been destroyed. Serious environmental damage has been done. Yunnan is China’s most bio-diverse region, with 53 percent forest coverage and 3,400 square kilometers of natural wetlands. But while those figures sound high, environmental damage and a failure to invest in protection remains apparent. Forest cover includes huge swathes of commercial rubber, eucalyptus, and fir plantations. Little original forest, which is able to store water, is left. A 2013 Greenpeace report estimated that just 9 percent of total forest cover was original forest. Central and northwestern Yunnan, where water and soil loss due to damaged forests is most common, has been hardest hit. In the prefecture of Chuxiong, forest cover has dropped from 12.8 percent sixty years ago to 5.2 percent today. These areas tend to be arid valleys, already lacking precipitation, and deforestation makes droughts and landslides more likely. In these ecosystems, loss of vegetation is hard to remedy and a cycle of droughts may start. What’s more, recent years have seen secondary forest—the bulk of Yunnan’s forests, important for retaining water—converted into commercial forest plantations. These plantations are home to a single tree species, have little undergrowth, and retain little water: if it’s raining the ground is waterlogged, if it’s not raining the ground is dry. The value of natural forests has been ignored. Despite years of drought, better-protected nature reserves have coped well, and have even been able to provide drinking water for neighboring residents through small pipe networks. The difference with badly degraded areas is clear. The damage reflects a failure to protect forests. Of Yunnan’s six rivers, the Lancang, Nu, Hong, and Irrawaddy leave China to become major international rivers. And of the six, only the Yangtze enjoys protection of the natural forests at its source (the only other place where such measures are in place is Xishuangbanna, in southern Yunnan). Investment in other rivers is low. Without incentives to protect the environment, forest owners are more inclined to plant profitable cash crops. Protecting natural regulation of the water supply should be the primary objective for Yunnan as it attempts to combat droughts. Anything else will simply worsen the problem. Yunnan’s ample precipitation has allowed the province to overlook the consequences of water pollution. Many rivers and lakes, including Dianchi Lake outside the provincial capital Kunming, are now polluted. In the dry season, some areas have no drinkable water. Dianchi is a typical example. Thirty years ago, its water was Class III, making it suitable for use in daily life according to China’s water quality assessment system. Now it is heavily polluted, and provincial capital Kunming has had to build infrastructure to bring water in from elsewhere. Pollution from the expanding mining industry is making river water undrinkable. The Bi River, a tributary of the Lancang, is another good example. It used to provide drinking water for hundreds of thousands of people, but now it is one of the province’s most polluted rivers, ranked as sub-Class V, the worst grade. Lead and zinc mining have sent heavy-metal levels far above permitted levels, while residents of county seat Yunlong can no longer drink direct from the river—they take their water from a nearby nature reserve, meaning rural areas lose out to ensure supply to the town. Of Yunnan’s six rivers, the Jinsha, Hong, and Pearl are all polluted. Of its nine plateau lakes, only Fuxian and Lugu still have Class I quality water. Erhai has improved after treatment, but the others remain polluted. If water pollution is not dealt with, there will not be enough clean water. Dumping of domestic waste in Yunnan’s rivers is also a problem. Without appropriate waste disposal services, both rural and city residents habitually throw rubbish into the river. At Lujiangba, on the Nu River, it is common for waste to be dumped unsorted into rivers, and this type of pollution is more apparent during droughts. The drought continues, and nobody knows how long it will last. An urgent response is needed. Hydrological projects to retain and distribute water may sound wise, but if environmental damage and pollution is not tackled, the water retained may be undrinkable. What Yunnan really needs is protection of the primary vegetation that remains and reductions in the replacement of water-retaining secondary forests with artificial plantations. The rampant mining and hydropower development currently under way must be subject to stricter environmental assessments, to ensure drinking water does not become polluted. And there is also an urgent need to solve the problem of pollution from waste.